SPORTSMAN OF THE YEAR: We are pleased to present Larry Lingle as WBC's 2011 Sportsman of the Year. After 2010's razor thin margin of one vote separating the top three contenders, this year provided more clarity as our winner more than doubled the vote percentage of last year’s recipient by garnering more than 20% of the 251 votes cast. The three-time Star Wars; Queens Gambit champion had his semi-final game all but won by merely playing out his hand normally, but he didn’t want to win by time limit, so he passed on his own moves, allowing his opponent to beat the clock and win the game as Anakin brought down the Death Star, ending Larry's quest for his fourth title. His main competition for free lodging this summer was Eric Monte whose rectifying of an incorrect Ticket to Ride score garnered more than 12% voter support. Following Monte was Thomas Drueding at 9%, a pair of Greenville Mafia lads (John Emery and Tim Rogers) at 8%, and grognard Kevin McCarthy at 6%. Given all the swag Cap’n Larry hands out in his Pirate’s Cove event, it is truly fitting that he be our guest in 2012. More details can be found on our Sportsmanship page. WBC TRIAL EVENTS ANNOUNCED: BPA thanks its members for their participation in the voting process during the 2012 Membership Drive that validated this year's eligible 25 Continuing Trial events. Martin Wallace's new Dominion Euro/wargame spinoff A Few Acres of Snow led all events with 300 votes and was the only new event to make the cut. It was followed by Richard Borg's Commands & Colors Napoleonics in its second year at 269. Golden oldie Diplomacy returned after a three-year absence as did Goa after a brief 1-year hiatus, but otherwise the list was dominated by returning events from 2011. However, four events continued their fall from grace dropping not only out of the Century but failing to catch the member's collective sympathy and losing Trial Status as well. Adventurers (2 yr), Imperial (5 yr), Stockcar Championship Racing (10 yr) and Titan Two (18 yr) are now in danger of ending their run at WBC in 2012. Doubtless some of these will be saved by sponsors or used as replacements for qualifying events without GM commitments. The complete voting results are available on our Trial Vote Results page. The selected events are now eligible for inclusion in WBC 2012 upon receipt of a suitable event form by Feb. 28 from a current BPA member willing to serve as the GM. Events for which no such GM commitment is forthcoming will be replaced by BPA from those on the Alternate list. Vendors and sponsors may also select events from the Alternate list or altogether different events provided they have a GM commitment. To be added to the Alternate list, an event must have an event form submitted to BPA by a willing GM who is a current member. WAM X ALMOST HERE: Washington's War headlines a quartet of CDW tournaments including Hannibal, Combat Commander and Twilight Struggle which will be offered for the four day-conference, in addition to the usual slate of Open Gaming opportunities. For more information on the Jan. 26-29 convention to be held in the Timonium, MD Holiday Inn, see our WAM page. GM RESERVATIONS: All WBC GMs are reminded that their "reservations" for events they ran in 2011 expired on Jan. 1. To retain GM status of an event, you must submit a new Event Form and renew your membership. Many events are currently listed as OPEN on the Orphans Listpage for lack of a GM commitment. See the current lineup and GM vacancies on our Orphans page. Vendors/Sponsors are likewise reminded to submit or authorize their 2012 Trial Events by Feb. 28. We also are in need of Seminar speakers. Contact us at conventiondirector@boardgamers.org with any suggestions for same. 2011 PATRONS: BPA's list of 2011 Patrons is posted online. Please report any inaccuracies to conventiondirector@boardgamers.org no later than Jan. 31 to ensure an accurate listing in the upcoming Yearbook. BOD NOMINATIONS: All BPA members are hereby notified of their right to nominate members for the three Board seats whose terms expire at the next WBC. To appear on the ballot, a member must be nominated in writing by at least three members; one of which must be himself/herself. Nominations must be signed and received at BPA, 7766 Valley View Court, Hickory, NC 28602, no later than Feb. 28 to be eligible for election in that year. NOTE: Email nominations are NOT acceptable, nor can a member nominate more than one member for the Board. When contemplating nominations, members are urged to consider that the BPA conducts most of its business by email and needs Board members who are able and willing to offer their time and skills to the organization in a timely manner. Board members should be considered more for their ability to contribute to the running of a successful company than for their attachment to any particular game or genre. Besides forwarding a signed nomination, each nominee should submit by March 1 a statement not to exceed 100 words summarizing what they can contribute in service to the Board of Directors of the BPA. The nomination form is online. BATTLES OF THE AMERICAN REVOLUTION: The current Email tournament began with 24 players and after four rounds over four very different battles of the American Revolution four players advance! The battles began at Eutaw Springs where the upstart Americans held a slight advantage with a 6-5 record. Play then moved on to Guilford Courthouse where Cornwallis held a 5-4 advantage. We then shifted north to Pennsylvania where the common belief is that Howe's redcoats are very difficult to contain. It may be an anomaly but, the Americans gave as good as they got breaking even with a 3-3 split plus a concession. The last of the Swiss rounds moved north again to New Jersey and Washington's Holding Action at Monmouth. Here the British proved their mettle winning two games and the others ended in a draw. The four players left standing are Bill Byrne, James Tracy, Dave Stiffler and Chris Easter. They are revisiting Eutaw in the semi-final and the Final will be fought at Saratoga. Good Luck to the final four! ADVANCED CIVILIZATION: Eight preliminary games have been played in our first ACV PBeM tournament to narrow the original field of 31 players down to eight finalists. Kevin Worth led the field with a final score of 208. The final game began in December and is currently on Turn 7, with Joe Lux holding a 2-point lead over Jon Anderson. The 2012 Advanced Civilization PBeM tournament will begin March 1 with registration open through Feb. 26. 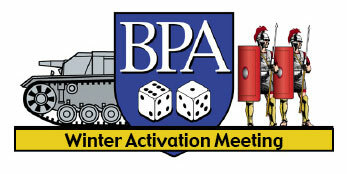 For details of the 2011 and 2012 events, see http://bpa-civ.rol-play.com/. Registrations can be sent to kevinyouells@gmail.com.